I love sharing about things I use (or want to use!) in my kitchen. 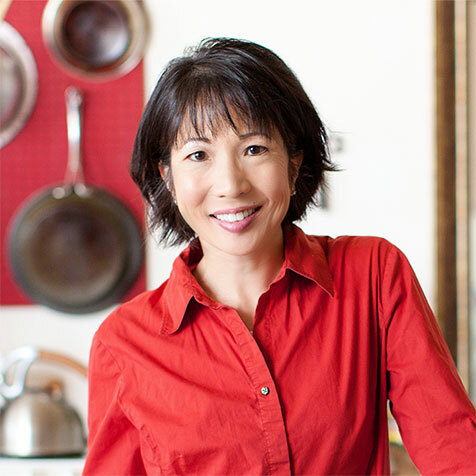 Enjoy this year’s Favorite Kitchen Things post! Photo by Imei Hsu 2018. 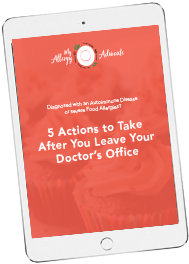 Each year since the creation of the My Allergy Advocate blog, I’ve talked about favorite kitchen must-have’s and kitchen things that I love to use. As I add on, I admit it’s getting harder and harder! At some point, your kitchen and mine have the basics we need, and probably a few extras that aren’t necessary yet you simply enjoy them. For the 2018 edition of, “My Favorite Kitchen Things,” I’ve arrived at that place where I have what I need and most of what I want. What remains are simple pleasures and things with, “Oooh!” factor for those of us who spend a lot of time in the kitchen making our own food. Our home kitchen is only so big, so adding new items sometimes comes down to counter and shelf space. And when we combined our homes, we discovered that while we had a few duplicates, we also had to dedicate use to certain items, such as a strainer for M’s pasta, and a pot with a strainer built into the lid dedicated to my gluten-free pasta. All to say, I take the addition of new items fairly seriously. Disclaimer: I am not an Amazon Affiliate, and because I don’t have the kind of large following yet to be offered an affiliate account, I cannot place links to Amazon on this site for the products. Any links here are directly to the manufacturer’s website; just click on the name of the item). You are welcome to search Amazon and Amazon.smile to make purchases if you are interested in the product. This year’s items were selected across two variables: 1) Cost, and 2) Use. What purpose does it serve if you bought something fancy and expensive, but you don’t use it very often? Conversely, if it was something with a higher price point, but you used it almost every day, that item becomes a workhorse that replaces something else, such as an InstantPot replacing an old slow cooker and pressure cooker, a high-speed blender, or the Hestan Cue smart cooking system replacing the purchase of multiple recipe books. Wear this peeler on your finger and slice it along the surface of fruits or vegetables. this Palm Peeler from Chef’n protects you from coming in contact with blade while making quick work of a tedious job. It also comes with a blade cover, so it’s easy to travel with. I own a set of Japanese, single-bevel knives that can be easily damaged in the sharpening process. 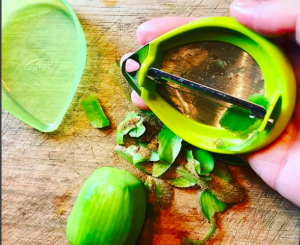 Instead, a proper sharpener for any Asian-style kitchen knives (including cleavers) will keep your knives sharp and ready to chop vegetables and herbs with ease. The Chef’s Choice is modestly priced and can be easily stored in a closet when not in use. Next time you want to throw a sandwich in your commuter bag or backpack, try one of these handy Stasher brand reusable silicone sandwich bags. Cashew nut, jam, and bacon gluten-free sandwiches happened during one of my longest endurance runs. Wash and reuse, no more plastic baggie to throw away, and the silicone gives it just enough protection to keep the sandwich from being squashed without a heavy hard plastic case or lunchbox. Whether you are an athlete or not, these Hammer gel flasks come in handy to carry your customized sauce, soy-free coconut aminos, or pureed sweet potato for those times when all the offerings are a “No” for you. If you don’t want to carry food in a squeeze pouch made for a child, this gel flask is another inexpensive option, plus they fit on hydration belts with a gel flask holder built in. Click that on your belt, and flaunt your Medical Unicorn self with pride! The Breville Custom Loaf bread machine does all that, and more. It has a special drawer for adding herbs, fruits, and nuts, and it has a useful gluten-free baking cycle that skips the lengthy proving cycles for the the typical rising times of a wheat flour based bread, a decently long mixing cycle (to add air and let it combine ingredients that include emulsifiers such as psyllium husk or Xanthan gum, and a longer bake cycle, which is related to the type of gluten-free flours that produce a denser bread. What I’ve been doing with my conventional bread machine is either finishing the bake in a conventional oven, or toasting individual slices to get the perfect crispy finish. The Breville Custom Loaf’s gluten-free setting claims to take care of your gluten-free loaf so that you won’t need any extra bake time. However, I don’t have an extra undesignated $299 to test that claim, so I am going to take the reviewers at face value who say it works as described. As I don’t eat a lot of bread, I’m torn about investing in a new bread machine. Chances are, my old one is outdated enough to only find a home by donating it, and if it’s time to do that, I’d be happy to do so. If you were to ask me which one I would steer you towards if you have never had one, and you needed to dedicate that bread machine to gluten-free flours only, the Breville is it. Got a kitchen appliance, gadget, or gizmo that makes food fun again for you that has not been in any of the past lists since 2015? Please share it in a comment below, and I’ll try to review it for 2019.